Circuitry | Gasmaster Industries Ltd. 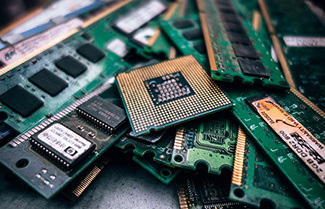 Printed circuit boards (PCB) are used in practically every electronic product and has fast become one of the world’s largest technological manufacturing industries. When it comes to cleaning circuitry with precision, it’s important to use a pure source with as little contaminants as possible. There are three grades of water that can be used to clean machinery, tap water, distilled water, and de-ionized water. Only de-ionized water is considered pure enough to clean PCBs without damaging the integrity of the circuits and leaving residues. De-ionized water is also measured by the water’s resistance to electric current (OHM-cm). The minimum required quality for PCB is 1 megaohm of resistivity, but high-end manufacturers often use as high as 20 megaohm water. Heating de-ionized water (especially the higher you go in megaohms) can be tricky since the water tries to regain ions by eating metal boiler heat exchangers. Gasmaster Industries hot water heaters and boilers are built using 316/316L stainless steel, an ideal grade for preventing aggressive de-ionized water metal pitting. Their high efficiency allows circuitry manufacturers to heat de-ionized water at a lower cost than other boilers without the fear of metal weakness causing safety issues.